Caption slip reads: "Photographer: Rustan. Date: 1959-01-06. Reporter: Donoghue. Assignment: Hospital art. Special Instructions: Daily. 39/40: Mrs. Irena Petraitis, 60, formula technician at maternity division of Queen of Angels Hospital, explaining her 'Lithuanian Girl,' one of her 10 oils at hospital art show, to Sister M. Geraldine, night supervisor at institution. 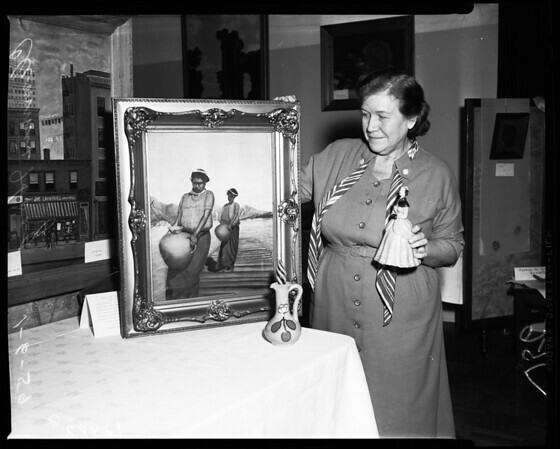 55/56: Clemmis Hoag, laboratory technologist at Queen of Angels Hospital, with oil and ceramics she entered in art exhibit by medical, nursing and other personnel of the institution. Oil shows North Africa women with oil jugs. She is only exhibition entering two art forms at show."